Sip your coffee in the master retreat as the morning sunshine pours in. On a warm summer day you can take it outside to the 36 foot master balcony. Experience spa like luxury in the ensuite with a claw foot soaker tub, double head shower, and two completely separate his and her vanities. Four additional oversized bedrooms, two up and two down) offer a comfortable sleeping space for everyone. Movie nights? Yes please. There is a large media room in the basement perfect for screening your favorite films in a theatre like setting. Enjoy a quiet evening on the deck or in the sunken hot tub complete with a gas fireplace to add to the ambience. The triple attached heated garage allows you to park your vehicles comfortably and offers some added storage. Mechanical is excellent with hot water on demand plus holding tank in floor slab heat in the basement and two high efficiency furnaces. There are two wells on the property and high capacity septic tank which will more than adequately service this large home. Courtsey of COLDWELL BANKER HOME SMART REAL ESTATE. Home for sale at 274182 256 ST W Rural Foothills County, Alberts T0L 1K0. 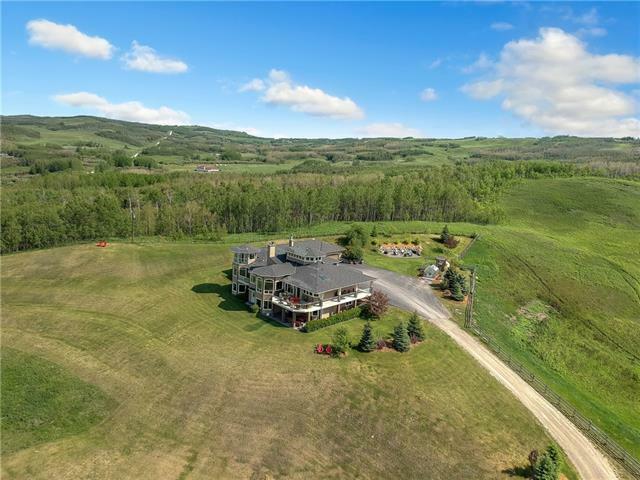 Description: The home at 274182 256 ST W Rural Foothills County, Alberta T0L 1K0 with the MLS® Number C4222983 is currently listed at $1,275,000.